Why does one enter for the Distinguish Teacher Award at the NMMU? For some entrants it could merely be to win an award. But why do people enter the Iron Man or the Comrades? Is it about winning for the most of them? The answer to the above stated question is probably that for these participants it is not about winning first prize; rather, it is about the process – trying to discover oneself through preparation and self-reflection. So what is implied by reflection? Reflection is an on-going process, a process through which one examine or scrutinize one’s practices and experiences in order to learn from these practices and experiences (Kolb, 1984; Schön, 1984). Teachers and lecturers seem to have many assumptions about why their teaching (or lecturing) is successful, as well as why their students perform well. On the other hand, they also have assumptions pertaining to why their teaching (or lecturing), as well as their students’ learning, is not on the level that it should or could be. The issue at hand here is the concept ‘assumption’, as assumptions are not fundamentally based on empirical data. Thus, an assumption is a ‘hunch’ or ‘what we think’. In order to move away from assumptions, one has to gather data as evidence. It is suggested that four different sources could be used as ‘critically reflective lenses’ through which teachers and lecturers (both professionals) might be able to render a picture to ascertain whether there is any evidence to support their assumptions. 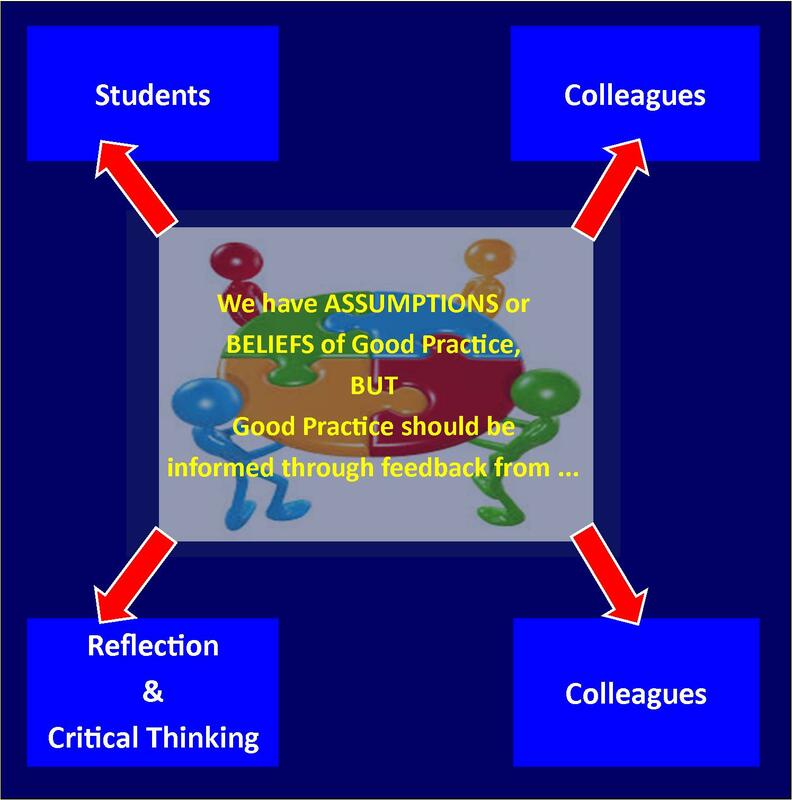 These four different sources of feedback (See Figure below) are the students’ experiences of one’s practices, colleagues that provide feedback on what they have noted about one’s practices, drawing on theory, and critical self-reflection (Brookfield, 1995). At the same time, effective critical reflection is embedded in four C’s: continuous, connected, challenging and contextualized (Eyler & Giles, 1999). •Where do I come from? •How do I view teaching and learning? •How can I improve my practice? •What have I achieved during this journey? •Where do I want to go from here? These above-stated questions formed the basis for my reflective journey, which is documented in the subsequent sections.